Despite a new and attractive setup at Roger Sherman Baldwin Park on Greenwich harbor and a sudden rain squall that drove concours spectators into Bonhams tent [resulting in a rash of catalog sales, the price of refuge from the elements] the Greenwich Concours d’Elegance crowd proved a tough one for auctioneer Rupert Banner. 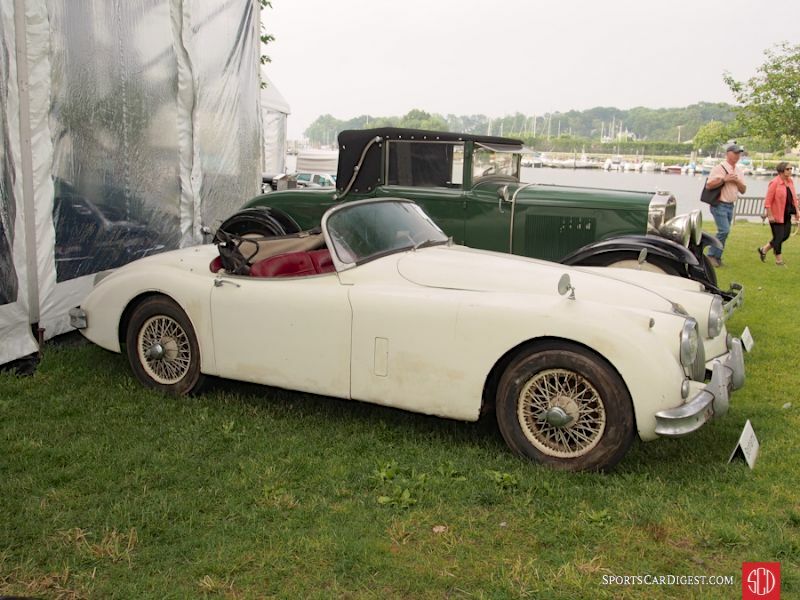 This was Bonhams ninth year at Greenwich and the Wennerstrom family re-organized the concours layout to better utilize the harbor-front vistas and provide more and better space for a growing cadre of vendors, exhibitors and the Bonhams auction. Greenwich is one of the most wealthy communities in the world (despite the state of Connecticut’s determination to balance the state’s overblown budget from the pockets of its most successful residents which is causing a corporate exodus including the headquarters of General Electric) and the exhibitors reflected the considerable disposable income of its setting. So did the Bonhams bidders’ tent, but they kept their hands largely in their pockets. The headline lots mostly went home with their consignors. Six lots had bids in excess of the highest successful transaction, leaving high bids on the table for a total of $7,320,000 on those six lots alone. Had either of the two highest bids been accepted the sale total would have been Bonhams’ best ever at this event, but it was not to be. The overall numbers are quite good in sell-through and median transaction, aided by a sizable consignment of cars without reserve. It’s only at the top of the market where caution is moving to the fore, a situation that’s not peculiar to Greenwich or to Bonhams but is being seen across the board in the auction market. Most photos are by the editor but he had his head someplace where it was hard to see part of the time and one of the photos are catalog photography courtesy of Bonhams. 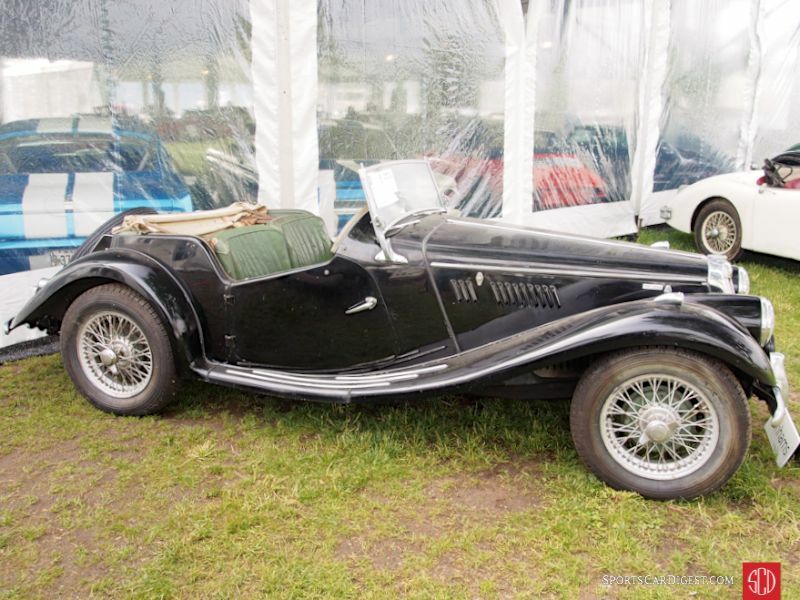 Lot # 3 1955 MG TF 1500 Roadster; S/N HDA466538; Engine # XPEG638; Black/Green leather; Faded cloth top; Estimate $15,000 – $25,000; Unrestored original, 4 condition; No Reserve; Hammered Sold at $12,500 plus commission of 10.00%; Final Price $13,750 – Silver painted wire wheels, Michelin XZX tires, fog lights. – A solid, sound California black plate barn find with too many issues and too much rodent poo to list in detail except to observe: wear rubber gloves and use a respirator while cleaning it up. – A project car bought for project car money. Lot # 5A 1957 Jaguar XK 150SE Roadster; S/N S831179; Engine # V2447-8; OE White/Red leather; Black vinyl top; Estimate $40,000 – $60,000; Unrestored original, 4- condition; No Reserve; Hammered Sold at $35,000 plus commission of 10.00%; Final Price $38,500 – Replacement engine, 5-speed gearbox, body color wire wheels, fender mirrors. – Rough, neglected bam find with too many issues to describe. Rotten right sill and door bottom with bubbling filler. – This will be an expensive project not to be undertaken by the faint of heart, light of pocketbook or easily discouraged but at least the price leaves some reasonable headroom to take care of the most egregious issues. It will, however, always be the wrong engine. 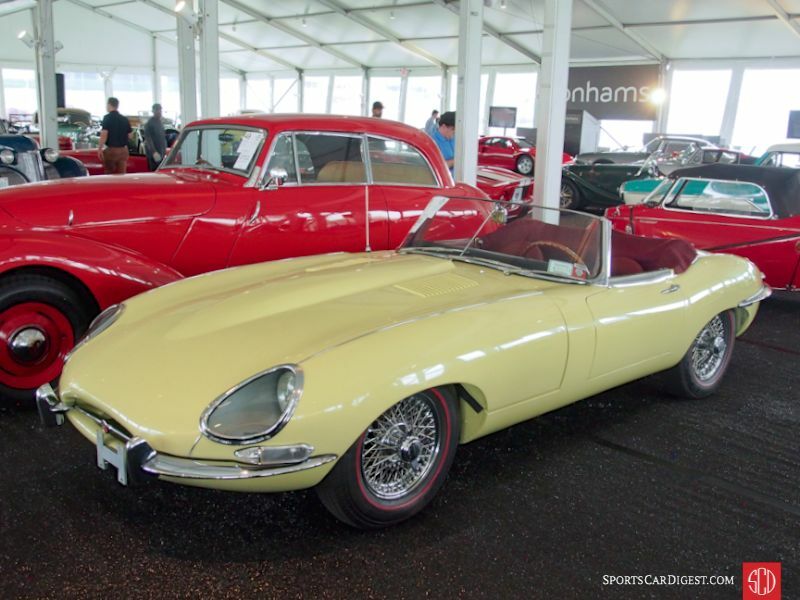 Lot # 9 1963 Jaguar XKE SI Roadster; S/N 87997; Engine # RA3247-9; Primrose Yellow/Burgundy leather; Beige cloth top; Estimate $150,000 – $175,000; Modified restoration, 2- condition; With Reserve; Not sold at Hammer bid of $120,000 – Chrome wire wheels, red line Coker tires, Blaupunkt multiband radio, aluminum radiator, electric fan, 4-piston front calipers (originals included.) – Represented as matching numbers engine, later synchro gearbox, documented with JDHT certificate. Good paint, chrome and interior. Underbody painted over dirt and old undercoat. Engine polished up and reasonably done engine compartment and suspension. Top boot area is superficially fixed up. A decent, usable cosmetic restoration to good standards. – Although all the things done to this E-type are tasteful, sensible and reversible, and add significantly to its reliability, safety and enjoyability as a driver, they don’t add to its collector car value and the seller shouldn’t expect to recover the cost over and above that of a similarly good restored-as-new E-type. The reported high bid is reasonable. Lot # 10 1989 Ferrari F40 Coupe; S/N ZFFGJ34B0000080727; Red/Red cloth; Unrestored original, 2- condition; With Reserve; Not sold at Hammer bid of $950,000 – Euro-spec without cats, adjustable suspension, 6-point Sabelt belts, rollup windows. – 8,929km. Engine compartment is aged and shows more use than the odometer. Seats are very good. Recently serviced and fuel tank bladders replaced. Reported to have had damage repaired in Italy and can’t be registered in California. 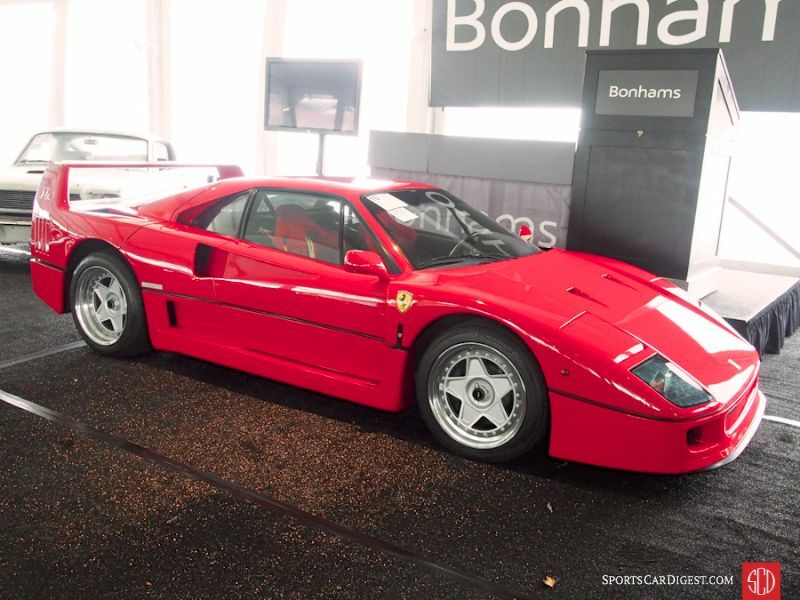 – Despite looking bright and fresh the aura of unspecified repairs suffused this F40 to the detriment of bidding interest. It is hard enough to move a car when it has identified damage and identifies the repair shop; finding someone bold enough to commit seven figures to a car with ill-defined damage is almost impossible. 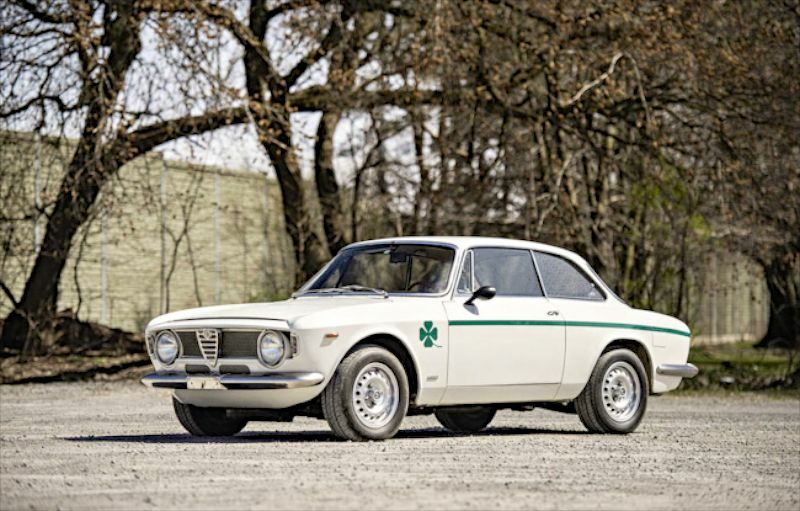 Lot # 21 1975 Alfa Romeo Giulia GTA Jr. Stradale Sprint, Body by Bertone; S/N AR776131; Engine # AR0055905377; Hawthorn White, Green accent/Black vinyl; Estimate $150,000 – $200,000; Visually maintained, largely original, 3+ condition; With Reserve; Hammered Sold at $140,000 plus commission of 10.00%; Final Price $154,000 – Aftermarket woodrim steering wheel, Campagnolo alloy wheels, 4.55:1 limited slip. – The last GTA delivered by Alfa, an original GTA with a decent older repaint and all the right GTA Junior stuff. Street registered when new, little used and displayed in Japan for years. – It was wonderful to look under the hood of this GTA with an expert and go through all the ‘right stuff’ on it. It’s just a truly neat, well preserved, correct car. The price it brought is, if anything, reasonable for its rarity, performance and preservation. It could have brought more and the premium would be understandable. 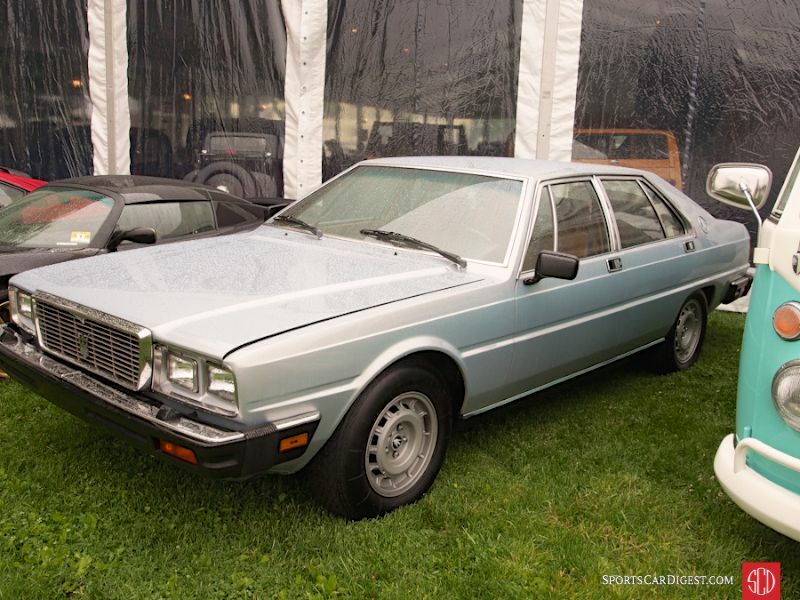 Lot # 23 1982 Maserati Quattroporte 4-Dr. Sedan; S/N ZAMBC1104CA301840; Engine # 10418; Silver/Cognac leather; Estimate $35,000 – $45,000; Unrestored original, 2- condition; With Reserve; Hammered Sold at $30,000 plus commission of 10.00%; Final Price $33,000 – Blaupunkt cassette stereo, air conditioning, power windows alloy wheels, Michelin blackwall tires. – One owner, 18,550 miles and in exceptional original condition. Owned since new and displayed at Ron Tonkin’s Gran Turismo Ferrari in Portland, Oregon. Comes with the original MSO, a clean Carfax, books, tools and jack. – This is as close to brand, spanking new as any QP III in the world and easily the best one I have ever seen. While scruffy, neglected examples are (and deserve to be) worth under $10,000 the new owner will never find one so good, pampered and nearly pristine. The price is all the money, but this is all the Q-porte you’ll ever find. 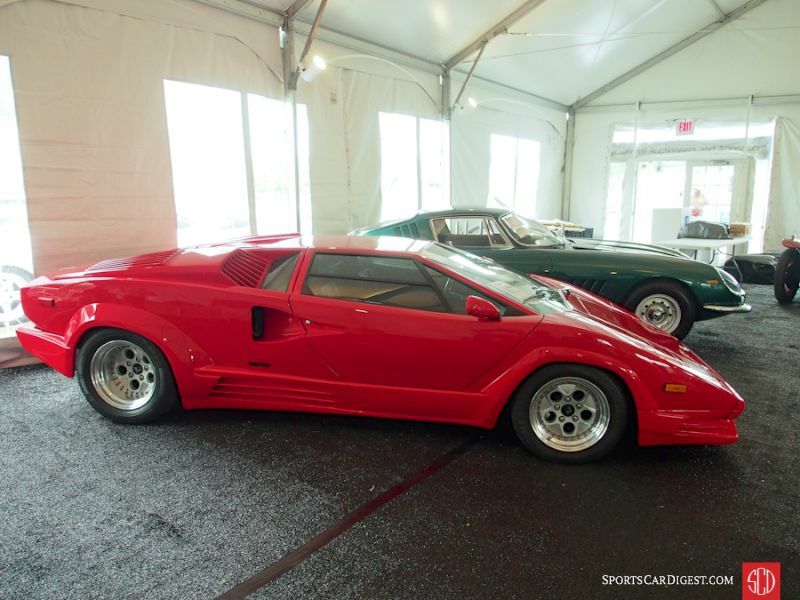 Lot # 24 1989 Lamborghini Countach Anniversary Coupe; S/N ZA9CA05A9K1A12699; Red/Black leather; Estimate $300,000 – $375,000; Visually maintained, largely original, 2- condition; With Reserve; Not sold at Hammer bid of $260,000 – Alpine stereo, phone dial modular wheels, Pirelli PZero tires, Euro bumpers, wing delete. – Good repaint with some masking flaws. Good original interior, underbody and glass. A current CarFax is not consistent with one issued in 2013. – The CarFax inconsistency may have affected the Greenwich bidders, with good and sufficient reason, similar to the F40 with referenced but unspecified damage and repair in Italy offered earlier today. 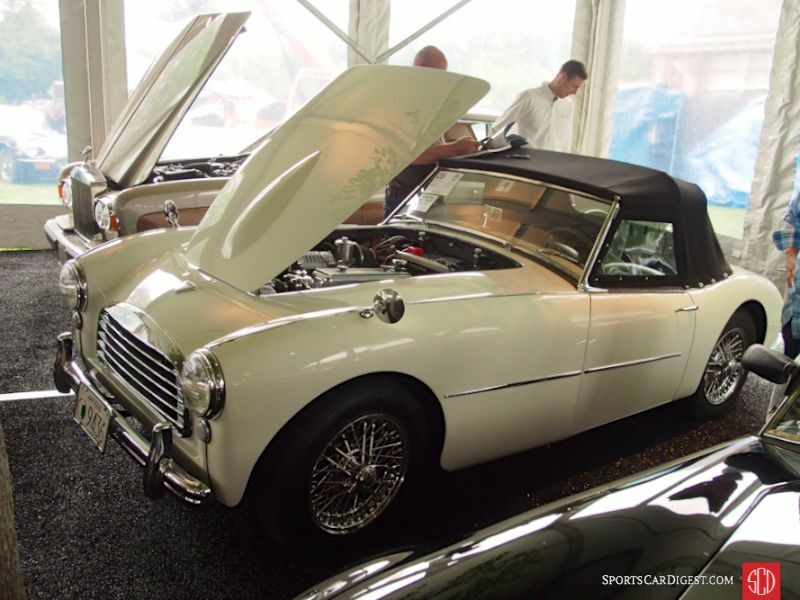 Lot # 28 1954 Swallow Doretti Roadster; S/N 1007; Engine # TS9376E; White/Grey leather; Black cloth top; Estimate $70,000 – $90,000; Recent restoration, 2 condition; No Reserve; Hammered Sold at $68,000 plus commission of 10.00%; Final Price $74,800 – Triumph TR2 drivetrain, Roots style belt driven supercharger, single big SU carb, full weather equipment, chrome wire wheels, fender mirrors, windwings, woodrim steering wheel. – One of only 276 built of which 80 or so survive, known history since 1974. A little Austin Healey-ish in profile or from the rear, but with a large egg crate grille. Very good paint, chrome and interior. Clean, sharp engine compartment and fresh, clean underbody. Restored like new and very appealing. – This is a generous price for a TR2, but also a sharp, fresh restoration and a recognized, but rare and attractive, small run marque that brought a highly respectable price. 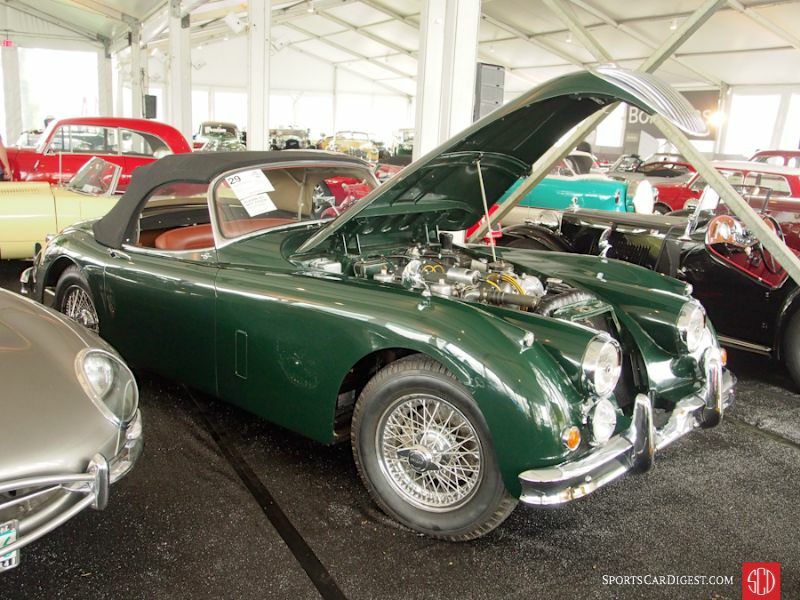 Lot # 29 1958 Jaguar XK 150S 3.4 Roadster; S/N T8315750DN; Engine # 1636-9; BRGreen/Brown leather; Black cloth top; Estimate $125,000 – $150,000; Cosmetic restoration, 3+ condition; With Reserve; Not sold at Hammer bid of $115,000 – 3.8 liter engine block, 4-speed, overdrive, chrome wire wheels, blackwall radial tires, fender mirrors, Lucas driving light and fog light. – Good paint with some fisheyes and three chips on the left side of the hood. Very good upholstery, lightly stretched, and soiled carpets. Underbody has been repainted assembled then driven appropriate to the 2,235 miles on the odometer. – While this Jag should be great fun to drive, but with its later engine and presentable but not exceptional cosmetic restoration the reported high bid should have seen it move on. I wonder what the reserve was on Lot 47. I’d rather pay 145K for this Mustang than lot 95 that is going to require another big chunk of cash. Each to his own, as they say.